If you own a local business, you are probably well aware of the fact that the world has become a very competitive place. It can seem difficult to find ways to stand out in today’s overcrowded marketplace. However it’s certainly not impossible for businesses with a passion to go above and beyond. Instead of tossing away all of your marketing dollars on flyers, newspaper ads, and door hangers like every other local business is doing, you can draw large-scale public interest by hosting an event in the community with vendor booths, games, events and inflatable rentals. Why inflatable rentals? Because they are BIG and colorful and people can’t help but to look when they see them! If you really want to be noticed within the community, you’ve got to create something that is beyond ordinary—something that people don’t see everyday. Inflatable rentals are also quick to set up, inexpensive, and create a festive environment for all age groups. Imagine your own drive home from the office each day or to the grocery story on the weekends. For the most part, the scenery never changes and things that are always there seem to fade into the background. Now imagine that one of the open lots or public gathering spaces is filled with gigantic, inflatable obstacle courses, a ring where people are wrestling each other in hilarious inflatable sumo suits, inflatable slides, and other big inflatable rentals. If you thing think this would catch your eye, then it will certainly attract the attention of your local clientele. By placing large vinyl signs with your company’s name and logo on the inflatable rentals, locals will not only be aware of your company, but also equate it with feelings of fun, goodness, and genuine compassion for the community. Design your event to attract your target audience. The purpose of hosting a big community event is not only to be seen, but to connect with your target audience. If your business is one that is serves kids such as a children’s hair cutting salon, then you’ll want to bill your community event as one that is fun for kids. However, inflatable rentals aren’t only fun for kids. There are inflatable rentals for all ages and tastes! If your business caters to adults such as a restaurant and pub, you’ll want to bill the festivity as an event for adults. Create a social “happy-hour” environment on a Friday afternoon where people can stop by after work and have a beer while challenging their coworkers to an inflatable gladiator challenge or racing on an inflatable obstacle course. If your business is an auto repair shop, spin the event as one where families can relax and have fun while enjoying a special discounted oil change. There is no limit to the way you can choose to market a community event with inflatable rentals. Although you do want to attract your target audience, you also don’t want to leave anyone in the community feeling like they’re not invited. Make it clear in all of your promotional materials that everyone in the community is welcome and that there is no admission charge. You may also want to create large vinyl signs with this same message for to hang at the entrances of the event itself. Effective ways to spread the word are with a detailed press release sent to local newspapers, radio stations, and television stations. List all of the activities that will be taking place such as the different types of inflatable rentals and the various food vendors so that people will have a clear idea of what to expect when they arrive. The more unique your event, the more likely it is to be mentioned by some of the high profile publications and stations in your area. The key is to never lose sight of the fact that this is an advertising tool. Hosting an exciting community event with inflatable rentals will likely be less expensive than ad space in many high profile publications. However, you can gain coverage in numerous publications for ‘free’ when you are hosting a newsworthy event that the media want to tell the community about. By hosting a promotional community event, you’ll realize so much more than just a memorable advertisement. 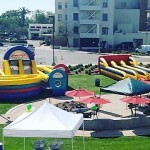 Hosting a fun event with inflatable rentals is a great way to meet and connect with the community you serve.